For our holiday open house every December, we ask guests to bring children's books that we then donate to a local organization that can benefit from them. This year we received enough books to make two donations - one set to the Sasha Bruce Youthwork, and one set to Huckleberry Cheesecake Child Development. This tradition was started by my late partner, Ellen Lepper. We proudly continue it every year in her name. 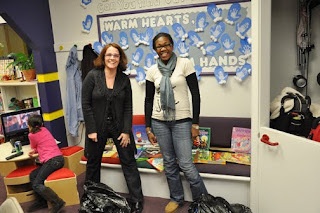 Here is a photo of Traci Sonenberg and Gina Sy, who accepted the books for Huckleberry. Thanks to all our clients and friends whose generosity makes this gift possible.